MYCB photo by Dan Thesman. 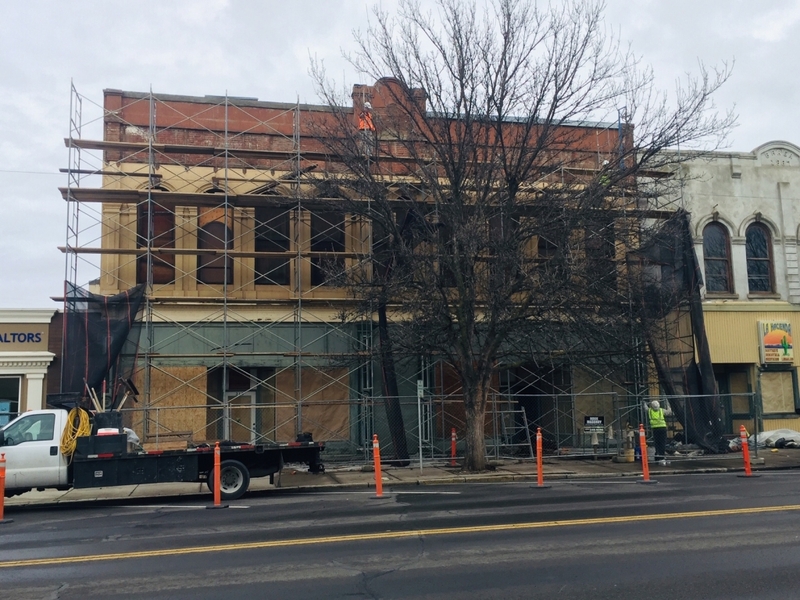 WALLA WALLA, Washington – A building that has been home to a number of businesses since the late 1800s is getting some much needed attention after sitting vacant for years. The building, located at the northwest corner of West Main Street and North Fourth Avenue has housed almost everything under the sun, including: a brothel, saloon, cigar shop, butcher shop, clothing store and a Mexican restaurant to name just a few. A crew from Ketelsen Construction said repairs to the structure at 210 West Main Street has uncovered a lot of history about the Italianate-style commercial building. From the crowned, hooded arched windows, the continuous window groupings and the bracketed cornices, the structure actually houses 3 buildings, one of which is former brothel known as the Rose Room. And if you look carefully at the back of the building, signage from the former cigar shop and clothing store are still visible. Mark Houk, owner of Houk Masonry, has also been hired to work on the building. His company has been hired to remove some of the exterior’s wood and restore the cornice, along with doing some brick work to stabilize the deterioration. “We’ll be putting up a whole new cornice,” Houk added. Houk emphasized the biggest concern was removing some of the deteriorating features on the building’s exterior before it came down and hurt someone. All of the property on that block other than Coldwell Banker First Realtors is owned by Christophe Baron of Cayuse Vineyards through Rose Rooms, LLC, according to Daniel Clark, coordinator of Walla Walla 2020, which is a civic group with the goal of envisioning, planning for, and undertaking projects to help realize a livable community in the Walla Walla area now and for the future. One of Walla Walla 2020’s key focus areas is the architecture of downtown Walla Walla and its neighborhoods.